Since 1977, he has diligently defended hundreds of individuals who faced serious charges in County, State or Federal courts throughout Florida and the Southeast United States. Board Certification When anyone is charged with a crime, the most important decision he or she may make is the choice of a criminal defense lawyer. Choose one who is skilled in defending against the accusations brought by local, state or federal law enforcement. First and most important, consider a Board Certified criminal trial lawyer. Mr. Lykkebak has been Board Certified in the State of Florida since 1987, the first year the exam to demonstrate expertise in criminal law was ever given. In addition, Mr. Lykkebak has also been board certified since 1988 by the National Board of Legal Specialty Certification. (A nationwide and universally respected board certification association). Martindale-Hubbell Rating Another good indicator of a lawyer's reputation, experience and the respect he receives can be found in his Martindale-Hubbell rating. Martindale-Hubbell is a directory to lawyers of the United States. For many decades, the Martindale-Hubbell company has endeavored to rate and evaluate lawyers. The highest rating a lawyer can receive is AV. Mr. Lykkebak has been an AV rated lawyer by Martindale-Hubbell since 1989. As a result, he is included in Martindale-Hubbell's directory of Preeminent Lawyers of America. Editorial Features Donald Lykkebak has been featured as a cover story in Florida Super Lawyers 2008 edition. He is annually selected by Florida Super Lawyers for recognition. Further, he has been featured in Orlando Magazine, the Orlando Sentinel and Orlando Business Journal. Education Mr. Lykkebak received his undergraduate education at the University of Illinois in Champaign, Illinois. He received his B.A. in 1968. He studied law at the University of Florida College of Law and received his Juris Doctor from Florida in 1970. That same year he was admitted to The Florida Bar as a practicing attorney, allowing him to practice before all Courts within the state. Military Donald Lykkebak served honorably in the United States Marine Corps. He was on active duty from 1970 to 1973 and in that period he held the rank of Captain. He was a Judge Advocate assigned to try special and general court martials. In that capacity he both defended and prosecuted Marines accused of crimes in the military. Former Orange County Prosecutor Following his military service, Donald Lykkebak returned to Florida and was employed as an Assistant State Attorney working for former State Attorney Robert Eagan from 1973 until 1977. During those four years Mr. Lykkebak represented the State in many criminal cases including the prosecution of well over 100 jury trials. He held the position of Felony Division Chief. Professional Advice Is Most Valuable Immediately Time is critical when consulting a criminal lawyer to help you. Anyone who believes that he or she may be the object of a criminal investigation or those who have just been arrested will dramatically improve their prospects for successful defense by discussing the alleged criminal charges with a lawyer as soon as possible. This means before ever discussing anything with the police. Don Lykkebak has represented individuals from all walks of life: professionals, including physicians, other attorneys, ministers, engineers and CPAs. He has represented hundreds of persons charged with narcotics possession and drug conspiracy. People charged with white collar crimes, capital crimes, DUI and misdemeanor offenses have turned to him for his expertise in criminal defense. He has aggressively defended felony charges against a mayor of a Florida city and also a former circuit court judge. In addition to handling hundreds of cases that do not draw the attention of the media, Mr. Lykkebak has successfully defended numerous individuals in high-profile cases-- from those charged with white collar crimes to others arrested for a variety of alleged criminal activity including fraud, embezzlement and theft as well as felony drug possession, even murder. If your situation unfortunately requires it, Mr. Lykkebak is accustomed to managing media demands and diminishing harm to you. If justified and you agree he may recommend a media relations expert as consultant on your case; one who is professional and savvy in effectively managing the news media in your best interests. This service can be invaluable to the professional person struggling to maintain his business or reputation during a pending public criminal investigation. The law office of Donald A. Lykkebak will represent your criminal defense legal matters. As a lawyer and Criminal Defense Specialist with more than 39 years experience, Don Lykkebak is well-known for aggressive courtroom defense in both state and federal courts. This experience has also developed negotiation skills very advantageous for his clients. He has extensive experience in complicated and extended jury trials. During the last several years he twice represented professionals accused of illegal weapons sales. He was hired to defend a German physician charged with conspiring to sell missiles to Middle Eastern countries. On another occasion he defended a Lebanese businessman accused of selling weapons to Iran. In both cases, extensive multi-week jury trials in U.S. District Court were required. Both cases were closely followed in front page stories throughout those extended proceedings. In addition to high-profile cases such as those recited above, approximately 50% of his law practice is devoted to defending people from drug trafficking and possession charges. Defendants range from misdemeanor marijuana possession (which is a particular interest by reason of many years as a member of the National Organization for Reform of Marijuana Laws legal committee) to clients whose Colombian cartel connection earned their photos a place on the cover of Newsweek magazine. Don's other areas of criminal law concentration include white collar crime, embezzlement and fraud. Many persons remember Mr. Lykkebak from his successful representation of a young man initially accused in the slaying of five students at the University of Florida during the early fall term in 1990. The young man was already "tried and convicted" by newspaper and national media before his family contacted Lykkebak. Don's advocacy not only addressed the criminal accusation, but also restoration of the young man's civil rights in an unrelated case that had been mishandled before Lykkebak was hired. The youth went on to graduate with honors from another university and has enjoyed a happy and productive life. During the last several years he has represented a Walt Disney World credit union executive who embezzled over $1 million; a mother charged with murder in the drowning deaths of two children; and a woman indicted for allegedly assaulting federal officers who violated her constitutional rights in a labor dispute involving immigrant workers, a physician charged with molesting a patient and a NASA astronaut charged with attempted kidnapping, burglary and battery. In each of these matters and in numerous other cases (see Significant Criminal Cases) Don Lykkebak strove to provide his clients with the best legal defense possible. Mr. Lykkebak's distinguished career in criminal law began with a three-year tenure as a Marine Corps officer serving as Judge Advocate (1970-73-Captain). As a Marine officer he both defended and prosecuted marines accused before special and general courts martial. 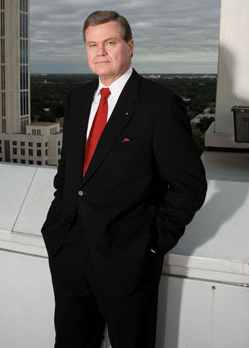 A graduate of the University of Illinois and University of Florida School of Law, Mr. Lykkebak also served in Orlando as an Assistant State Attorney for four years before beginning his successful private practice in 1977. As a state prosecutor he handled only felony cases and was a felony division chief.